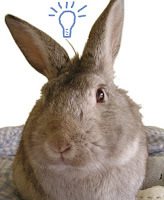 Cottontails Baby: I survived a networking event! I survived a networking event! I once had a job where I had to go to these things quite regularly and always swore that, working for myself, I wouldn’t put myself through it. But the topic sounded interesting and as much as I struggle to ‘network’ it can be quite inspiring to spend a few hours with other people from time to time. I love working here at home by myself but brainstorming sessions with Humphrey can be limited affairs. 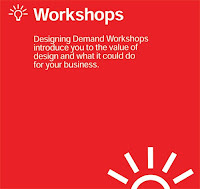 The event was a Designing Demand workshop, part of (to quote the literature) "a national support programme developed by the Design Council to help businesses use design to improve performance". I inadvertently arrived half an hour before the event itself got underway (the dreaded networking half hour) and after spending as much time as possible faffing around with my registration badge and then hiding in the loo, I finally had to muster courage and join in. Picking a table at these occasions is always a lottery – especially when ‘interactive exercises' are suspected - but I was very lucky and ended up sharing a table with two very nice men who ran a coffee machine company and a chap who I think was an art director on film sets (very glamorous if so, but I may have misunderstood this?). A breakfast buffet was available but I skipped this – if there’s one thing harder than talking to strangers early in the morning it’s doing it while eating a large breakfast bap. 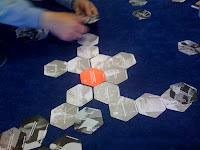 Our ‘facilitator’ (what a word) kicked off proceedings and after a bit of an introduction we had our first interactive exercise - we had all been asked to take along an example of design we either liked or loathed and had to discuss this with our table. I took the lovely new Belle and Boo catalogue (that’s a ‘liked’, obviously). The film chap brought a photo from the set of an iconic film I hadn’t seen, and the coffee machine makers forgot to bring anything at all so talked about their Blackberrys. This pretty much summed up the relaxed nature of our table which was such a relief. Throughout the morning we heard a lot about the role of design and ‘design processes’ in business, watched one another eat yogurt (thinking about the minute processes involved), played games with bottles of water and 'Matchbox - a business development tool' and looked at how great design has transformed the fortunes of a sewage company and some sausage makers. As far as Cottontails is concerned I am not yet certain what I will take from it – at the very least it has got me thinking about the Cottontails brand as opposed to the toy brands I supply, and I love the idea of taking inspiration from my 'environment' and making more of our premises – i.e. my home and garden. I think this might have a name - environment design? - and it sits well with some of the product directions I want to develop - for example, here I am working in a garden office, we have a beautiful garden, and I have a lovely range of children's gardening stuff due in soon. I'm sure there is a way to tie all this in, same with the house and kitchen and all our lovely play kitchen toys. I adore the 'french-ness' and 'scandinavian-ness' of the brands we support, but I'd really like to make more of how these can sit within an English countryside lifestyle. (With lots of rabbits thrown in too of course). Lots to ponder anyway. Mark Treverton from Marksman Leisure (outdoor fun activities) who was very proactive and brought leaflets around to everyone - I was too shy to hand out catalogues. 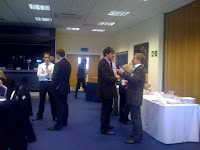 Networking in action - everyone looks very smart don't they? I, on the other hand, wore a flower in my hair (it was 'business-like black' though). 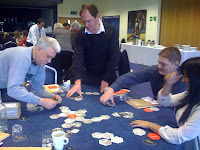 Here's our table playing the 'Matchbox' game and trying to use it to help the coffee guys design a new machine. Fortunately a nice lady from Designing Demand joined us to bring a bit of professionalism to proceedings. And this, apparently, is the answer to the coffee machine problem. Simple! I can't imagine having to go on one of these events ! Looks like it was an interesting event! Shame you didn't make it to TD but I know how life can take over! I wanted to look around the show myself but it was too tricky to leave my stand this year as I was on my own for 2 days. It's always nice to see Humphrey! Happy Pink Saturday! Now the fact is I would have had a large pink peony in my hair and would have been resoloutely in jeans and brogues, that's assuming you could have shoe horned me through the door! You did brilliantly to go along and whilst the impact isn't immediately obvious, as you say these things tend to develop organically form a seed that may have been planted. I say well done Charlotte!